Accra, Nov 27, GNA - The National Chapters Committee (NCC) of Accra Hearts of Oak Sporting Club has descended heavily on Mr. Kofi Nsiah, General Secretary of the Ghana Football Association (GFA) calling for his replacement in the wake of the postponed Confederation Cup final involving the country's two most glamorous clubs. The GFA on Wednesday announced the postponement of the Confederation Cup final two leg matches between Accra Hearts of Oak and Kuamsi Asante Kotoko at both the Accra and Kumasi Sports stadiums citing security reasons. The Committee subsequently organized a press conference at the Club's Secretariat on Friday calling for the immediate dismissal of the FA capo for his role in the postponement of the historic game. Mr. Neil Armstrong Mortegbe, Chairman of the NCC told the press that his outfit was amazed to have gathered from the offices of the Confederation of African Football (CAF) that Mr. Nsiah had long communicated to them about the association's desire to have the game rescheduled at a time both teams were attending series of meetings directed at ensuring an incident-free game. Describing the FA scribe's action as one that has seen the nation's sport take a further step backwards, the Chairman said Mr Nsiah's decision to communicate the FA's plans to CAF without the consent of the clubs amounts to gross disrespect towards the teams. Subsequently, they advised the General Secretary to stay clear from matches involving the Phobians and insisted that "from the signals we are getting, Kofi Nsiah's safety at our matches cannot be guaranteed since he has historically positioned himself as an anti Hearts". The Committee claimed that the build up to the two matches was the most serene seen in recent times, adding that the nation has therefore been deprived the opportunity of uniting the people through the nation's passion of soccer. Mr Mortebge said the NCC will fiercely resist any attempt by any group of person (s) to align the club to any political party and declared its complete disinterest in any political colouring of the Phobians. 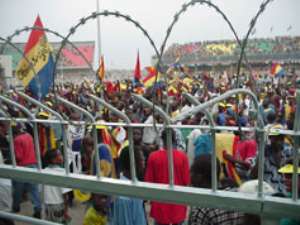 "Hearts of Oak pre-dates all the political parties that have ever arisen in this country; supporters of all political parties find a source of common humanity and humility in being Phobians and indeed, we are bigger than any political party and will forever remain a unifying force through persistent focus on football, not partisan politics", he said. He also called on the National Security Council to clarify their position with respect to the sudden twist that saw it assuring the clubs and its supporters about their safety only to turn round to support the recommendation for the postponement of the matches. The NCC claimed to have advised the Management and the Board of Directors of the club not to engage the "Porcupine Warriors" in any GFA sponsored organized match until they are convinced that the association's composition and disposition had been appropriately modified to ensure fair play in the running of the beautiful game in the country.